Naama Samantha: They provide a great customer service. It is nice to be cared about. Read what this Envision user has to say about her experience with our app. 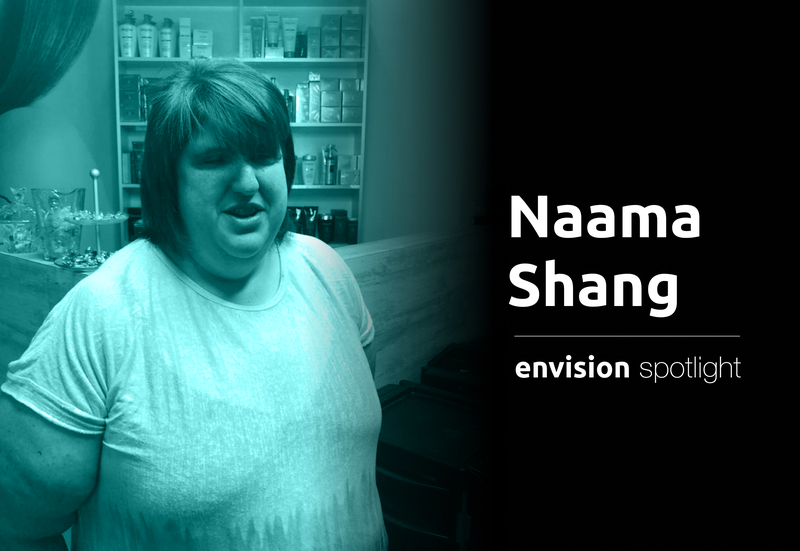 We caught up with an extremely vivacious lady, Ms. Naama Samantha Shang. She lives in Israel and has been there for about 20 years now. Naama spent her early years in the US, UK and Australia. She is an opera singer by profession and constantly in the quest to expand her music knowledge. This has led her to study about Scottish music and she already has a master's degree in Music. She is visually impaired since birth. A photo of Naama Shang. My typical day involves grocery shopping, exercise, singing gigs, taking out the guide dogs. I am interested in alternative medicine like aroma therapy, reiki, so I spend time on that as well. What is the biggest hurdle that limits you? According to me people's ignorance is the biggest hurdle. People fear someone else's difference, they assume we can't do anything by ourselves. We don’t get credit for our ability. I wish people were a bit more accepting and open minded, they will realise that we can do so much more. In which instances do you use Envision in your daily life? ‍Envision is only the product of its kind which supports Hebrew, the local language here. I mostly use Envision to identify products, read labels, instructions, computer screen, short texts, letters or bills. How did you do these tasks before using Envision? I didn’t have a product or app that I used to help me out with anything. At times, I got someone at the store to help me. It was mostly gambling with 3 jars while I’m cooking. I usually have to open and check the jars hoping that it is what I want. While traveling, I take help from people and some of the buses here are talking buses. How has Envision impacted your life? Envision changed my life because suddenly I don’t need help from others. I can do things by myself. It gives me a great sense of independence. What do you like the most about Envision? The fact that it can read Hebrew flawlessly and I’m in awe of the technology behind it. It is affordable unlike other apps which are too expensive and impractical. I don’t need a special phone which makes the app accessible. What stands out is, they provide a great customer service. Envision’s thinking is about the customer though it is a business. It is nice to be cared about and listened to. What is the one thing that you wish sighted people understood about living with visual impairment? They don’t understand that we learn to function because we've this condition from birth. They should not dismiss the fact that we can do things. We deserve to be given a chance, be it employment, education or music. Learn to give credit to everyone with disability. What is a life hack you swear by? Don’t live in a bubble. It is important to try new things and not be afraid to ask questions. I believe we can learn something from everyone. Do what you expect other people to do. We love her enthusiasm, fearless attitude and the will to grab every opportunity her way. Brett Halle: Envision has clearly taken more input from blind people. Read what this Envision user has to say about his experience with our app. Bob Offereins: Technology, and its power to empower. How emerging technology is empowering people in new ways. Leo Bissonnette : I like how simple yet powerful the app is.